The new conductive cooled Xeon Server from MPL allows the use of a powerful server in a very demanding environment. The server is installed in a 19" chassis and offers considerably more computing power, more memory capacity, more flexibility, and a more extreme temperature range than was custom up to now. In normal use, servers operate in air-conditioned rooms with forced ventilation and the operating temperature range is around 30°C. Not so the new MXCS server from MPL, it is designed to reach its standard computing performance without ventilation. If the ambient temperatures rises, servers tend to fail! The MPL server continues to work. This additional extended temperature range, up to +60°C, is achieved with MPL’s conductive cooling system. The air is not passed through the device as usual. The produced heat from the system is passed by the server passively to the heat sink of the housing. The Xeon server solution is designed to allow the system to be passively conductive cooled. The concept of conductive cooling can be adapted to the respective application and the installation location. Therefore, it can be used universally, on request it can even be equipped with a fail-safe ventilation system. 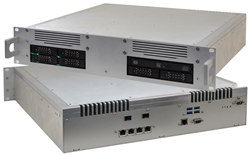 The MXCS is the perfect solution for an unlimited range of application like C4ISR, EW, imaging processing, surveillance, virtual machines, data center processing or any application that requires the highest computing performance in a small space without the need of a fan and highest reliability. The rugged design allows to install the MXCS e.g. in vehicles, tanks, railways, etc. The MXCS server is 100% designed and produced by MPL AG in Switzerland. The MXCS is designed to meet most standards like CE, UL, MIL-STD-810G, MIL-STD-461F, MIL-STD-704F, MIL-STD-1275D, CE, EN50155 or IEC 60945. For more specific information, please contact MPL AG.